Today at its F8 conference, Facebook announced its new Messenger Platform that will allow its 600 million users to create and share content with third-party tools, and communicate directly with businesses rather than calling or emailing them. The content tools platform and apps from initial partners including ESPN, JibJab, and Giphy, will become in an Messenger update available today. Facebook is working with a limited set of partners for business chat, which will roll out sometime in the future. 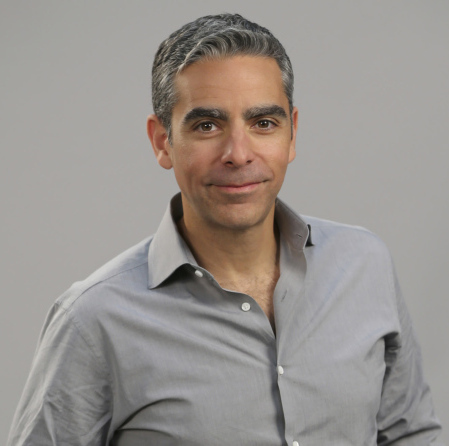 Facebook today released an SDK to help developers start building experiences for Messenger. Facebook also launched a slew of new capabilities for Parse developers, advertisers, websites, and the News Feed. You can see all the announcements in our “Everything Facebook Launched At F8” page. The Messenger content apps will be accessible from a triple-dot button in the composer next to options to add photos or stickers. Users will be able to get deeplinked into their phone’s app store to download these Messenger companion apps. From there, users can create content like animated GIFs and special effects-laden videos, or discover content, and then instantly share it to friends through Messenger. Each piece of content sent through the platform includes an attribution link to what app it was made with. A recipient can click to download or open that app and reply with a piece of content. Initial Messenger content app partners include ESPN, Bitmoji, JibJab, Legend, Ultratest, Ditty, Giphy, FlipLip, ClipDis, Memes, PicCollage, Kanvas, JJ Abrams’ studio Bad Robot’s Action Mobie FX, Boostr, Camoji, Cleo Video Texting, Clips, Dubsmash, Effectify, EmotionAR, EMU, Fotor, Gif Keyboard, GifJam, Hook’d, Imgur, Imoji, Keek, Magisto, Meme Generator, Noah Camera, Pic Stitch, PingTank, Score! on Friends, Selfied, Shout, StayFilm, Facebook Stickered, Strobe, Tackl, Talking Tom, Tempo, The Weather Channel, to.be Camera, and Wordeo. 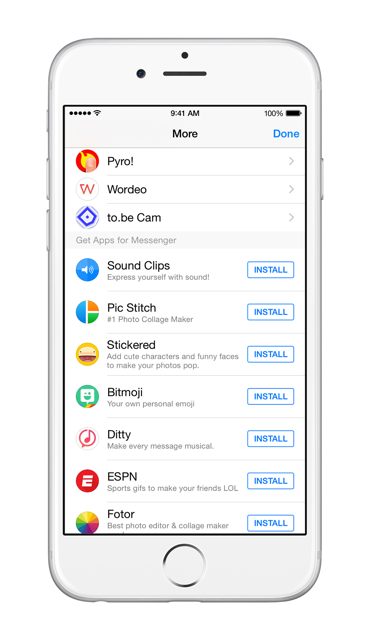 Rather than add the functionality of these apps directly into Messenger, which might make it feel cluttered and confusing, Messenger platform apps are their own separate companion apps. To select the partners, Marcus says Facebook employees starting testing creative expression apps, picked their favorites, and reached out. He says almost ever “almost every single one of them rose to the occasion and built something in record time for this.” And Marcus believes that since only users can send messages, not apps by themselves, spam won’t be a problem. By creating more vivid ways to share, Messenger could differentiate itself from SMS and competing messaging apps like WeChat, Line, Kik, KakaoTalk, and Google’s messenger. While Facebook doesn’t monetize Messenger directly, usage drives lock-in with its social network and News Feed where it makes money by showing ads. Facebook is also aiming to use Messenger to reinvent communication with businesses. The idea is that people hate touch-tone phone tree customer service calls. Endless email threads are annoying too. People would rather just text asynchronously in a single chat thread. To allow that Facebook is working with an initial set of partners including Everlane and Zulily to change how people contact them. For example, if you buy something through Everlane, but want to modify, track, or return your order, you’ll be able to contact the business through Messenger. And rather than getting individual emails about order confirmation and your order shipping, you’ll be able to opt to get those messages in Messenger. Customer support will be permitted over Messenger thanks to an integration with ZenDesk. Businesses that already use live chat systems for customer support will be able to run that communication over Messenger. Business will also be able to deliver push notifications to customers through Messenger, even if the merchant doesn’t have its own app. Businesses who want access to these features can apply here. While Messenger’s platform could increase engagement with Facebook and help users express themselves and solve customer support problems, it could also have a huge impact on app developers. Right now, the app stores are overrun with crap and it’s hard to find high-quality products. Messenger’s platform will create a curated way to discover great apps, giving developers the exposure they need to build their businesses. Facebook knew that to become the world’s top messaging app, it couldn’t do all the work itself. By tapping third-party developers and businesses to enhance it with content and business correspondence, Messenger becomes more than just a chat app. It becomes a communication layer between you and the whole world.